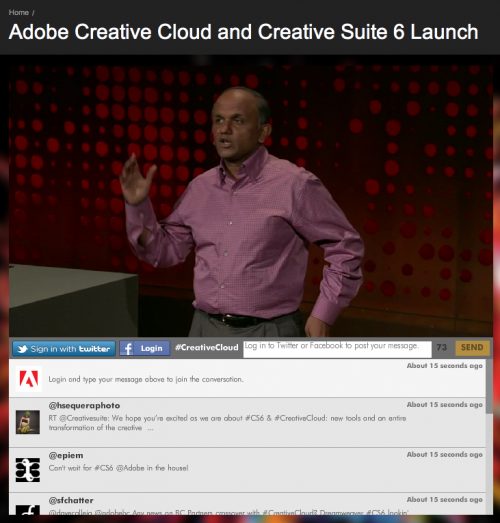 Adobe recently launched its Creative Cloud and Creative Suite 6. 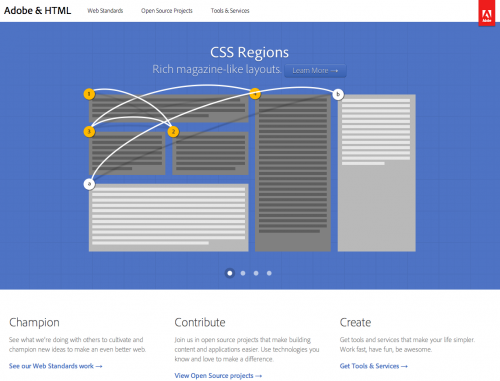 One of the biggest attention getters from the launch events was news that Adobe looks to taking a good hard look at how we layout content in HTML. Call me skeptical, but I’m really not optimistic about Adobe’s ability to make the ground move under the the huge HTML silo. But they bought PhoneGap you say, and that’s pretty cool. And they bought Typekit, which everyone uses, so that must be cool too! Right? It might be enough for you, but it’s not enough for me. All the counter-evidence I needed, I saw yesterday: Adobe filtered live tweets into the launch page while they were giving product demos. The catch? They used Flash to import them. I just can’t see how a company so rooted in the old way of doing things, and so entrenched in their own (sinking) technology can be the ones to lead the way to a better web. I’ll be happy to eat these words in 5 years time when Adobe has pushed the web forward and really made a useful dent in this huge ecosystem. But I’m not holding my breath.